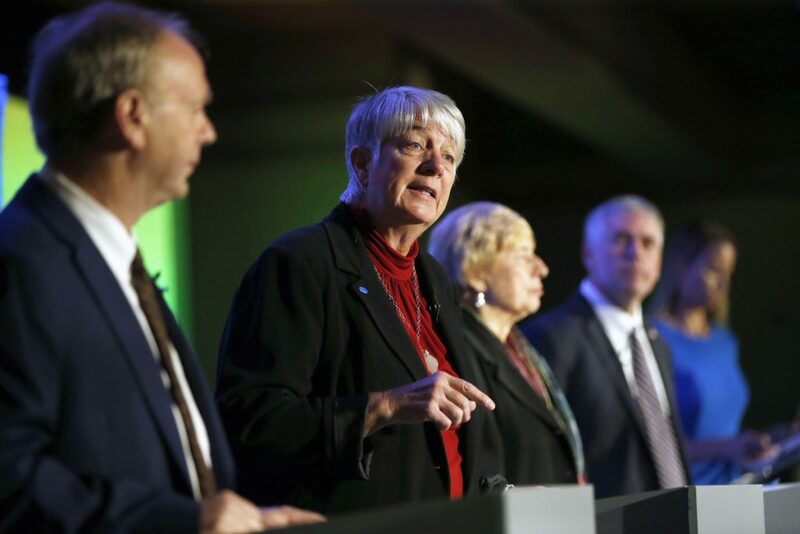 Education and the economy dominated a forum Wednesday attended by the four candidates for governor, the first time all of them have appeared together in weeks. Moody said he thinks schools need to “operate efficiently,” and that he wants to expand career and technical education and help teachers, who he described as overworked and burdened by too much bureaucracy. Independent Terry Hayes, the state treasurer, said she’d focus on investing in teaching and learning, with social services for students delivered outside of school hours so that instructional time isn’t lost. Moody, Hayes, Democrat Janet Mills and independent Alan Caron last appeared together Sept. 10 at a forum in Lewiston. The four are vying to replace Gov. Paul LePage, who is termed out of office. The race is being closely watched, partly because having four competitors means the vote could be split and a candidate with less than 50 percent of the vote could become governor. LePage won twice with less than 50 percent of the vote. The most recent independent public polling on the race, taken in early August, found Mills, Maine’s attorney general, and small-business owner Moody tied at 39 percent each, with Hayes and Caron trailing at 4 percent and 3 percent, respectively, and 16 percent undecided. 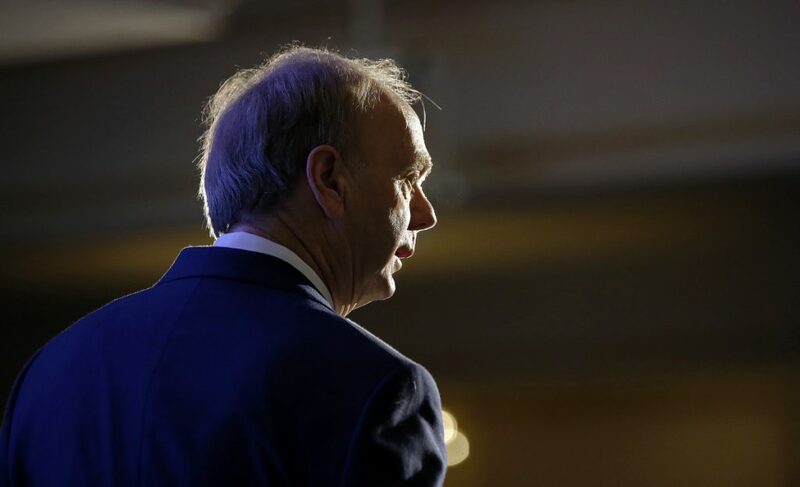 Caron has pledged to decide in mid-October whether to stay in the race, and to withdraw if he does not think he can win. Although Wednesday’s chamber event was billed as a debate – where candidates interact with each other and rebut the others’ positions – it was a forum, with each candidate answering questions from the moderator. The four meet again at 7 p.m. next Wednesday night at the Westbrook Performing Arts Center for an event hosted by WLOB radio, and more forums and debates are planned before Election Day on Nov. 6. Debates can play an outsized role in Maine, where 33 percent of voters are registered as Democrats, 27 percent as Republicans, 35 percent as unenrolled, 4 percent as Greens and 0.5 percent as Libertarians. None of the candidates has emphasized party politics, which has been fundamental to LePage’s approach to governing. His bombastic style, which played well to his base, frequently turned on vilification of Democrats, unions and liberal causes. A few times during Wednesday’s forum, Mills took jabs at LePage, accusing him of cycling through too many education commissioners and “sitting” on bonds for projects ranging from highway repairs to senior housing. “You won’t see me doing that,” Mills said. The candidates were asked about Medicaid expansion, which Maine voters approved in 2017 but LePage has refused to implement, citing budgetary concerns. 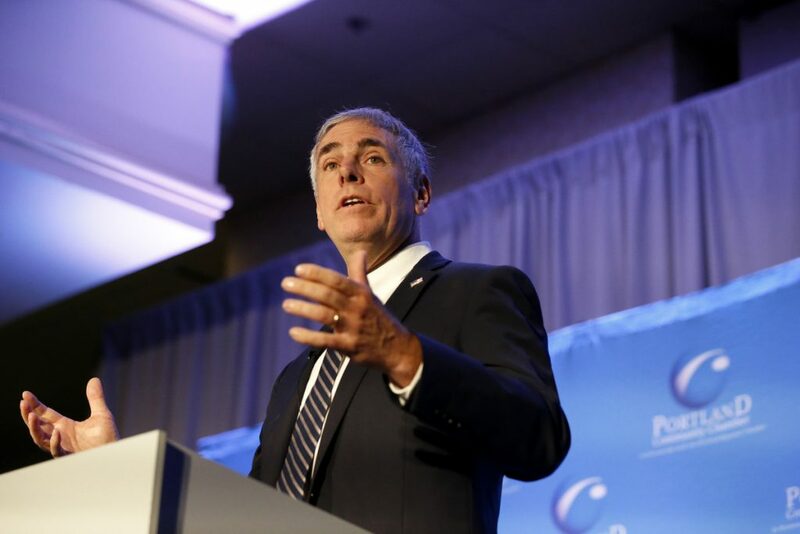 On deteriorating infrastructure, Moody said he would continue to build up the state’s rainy day fund in order to “spend our money smarter” by waiting to tackle infrastructure work in slower economic times when material prices decline and workers are easier to find. 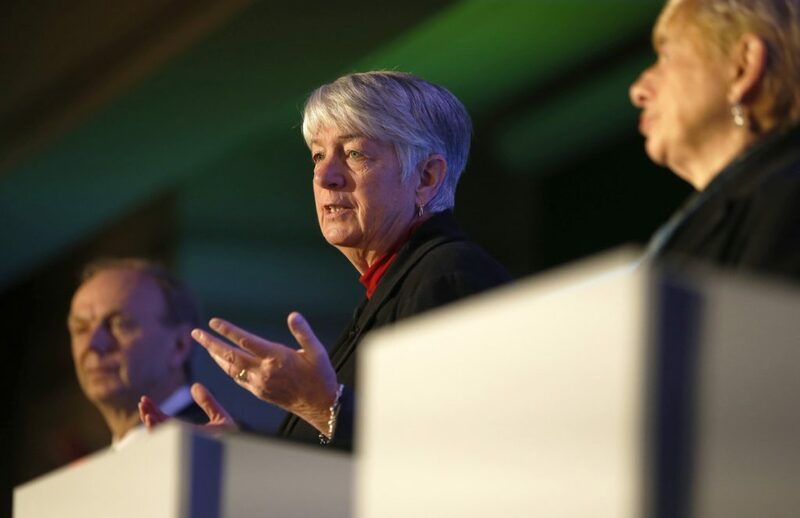 Mills said she supports Question 3 on November’s ballot, which would provide $105 million in bonds for roads, bridges and ports, and would prioritize expanding broadband and internet connectivity. Caron said he would shift away from trying to attract big employers from elsewhere and would instead invest in local entrepreneurs. Each candidate has a plan for addressing the opioid crisis in Maine, where drug overdoses have killed more than 750 people in the past two years. Mills said 535 people were saved by the Narcan distributed by her office to police statewide, and she would back health care coverage for treatment. Moody said he supported recovery efforts, but wanted data-driven solutions so money goes to programs with demonstrated results. 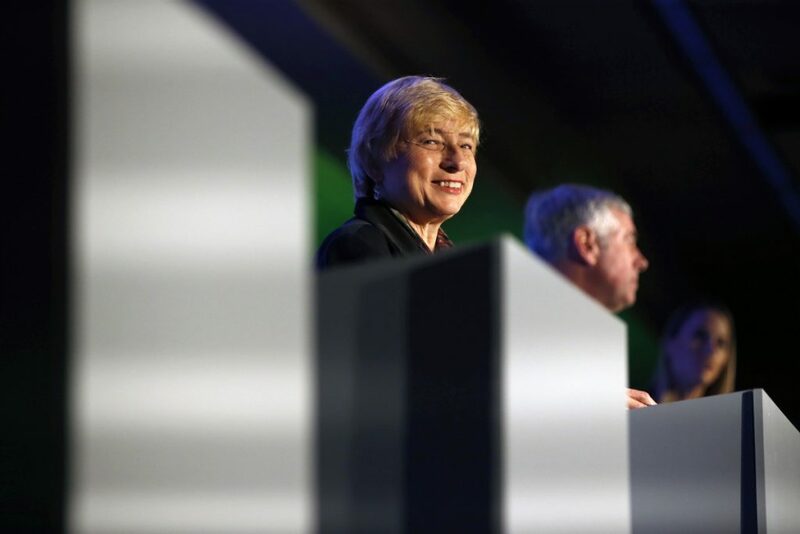 Caron said the crisis stemmed from “a hopelessness that has taken root,” and that improving the economy would help. Hayes said she would focus on ending the stigma surrounding addiction, and would invest money in treatment programs.